I finished the Far, Far Away II quilt on Saturday. Yesterday my husband was a trooper and we packed up the kids, dog, and quilt to go take pictures in the rain. Luckily it was pretty wooded so we didn't get too incredibly wet! I'm pretty excited about how this one turned out. 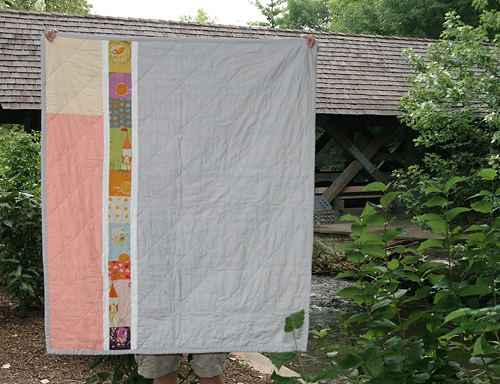 This quilt consists of three types of simple blocks. One set with 3" centers, one set with 4.5" centers and one set with 5.5" centers. There are 42 in total, 14 squares from each of designer Heather Ross's colorways. The fabric is a linen blend so it is a bit heavier in weight than quilting cotton. I think this makes for a perfect fall quilt. I have visions of draping it over the kids on wagon rides once the temperatures cool off. I wanted the back to be a soft palate and let the designs really be the main focus. After much deliberation, I settled on Kona Peach, Butter and Ash. The binding is Kona Ash as well. 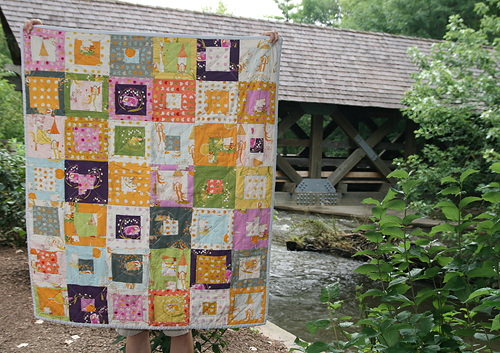 Since the linen is not as soft as the fabric I normally work with, I decided to loosely quilt this with diagonal lines. 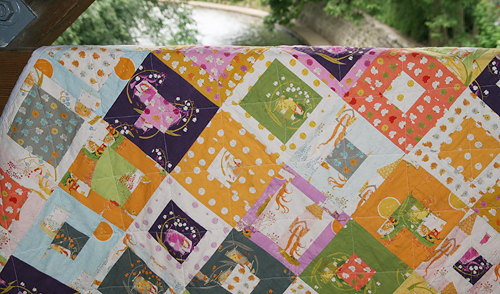 Can you believe I've never done diagonal quilting (I think...)? 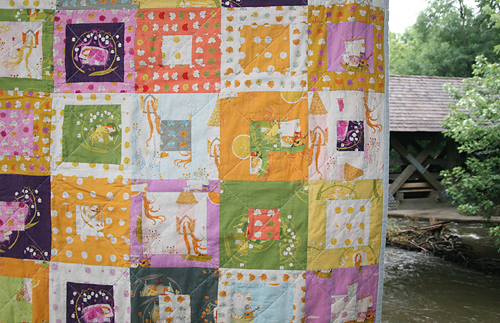 I really like the look and will definitely be quilting more that way. The final size is 42" x 50". I used Dream Cotton Request Loft batting, my usual.